-McGillis Schwalbe Graze: The Schwalbe Graze is a sister machine that used the same type frame of the Graze which is currently being deployed in the Earth Sphere and outer space as Gjallarhorn's mainline mass produced MS. The Schwalbe Graze is a trial machine that was born in the Graze's development process aiming at higher output and mobility, so inside Gjallarhorn, as a matter of fact, same type machines called Graze have been operating. Compared with the Graze which aimed for a further general purpose nature, the machine's stability during lower output is inferior so the pilot's talent is demanded for steering. On the other hand, it's superior in the highest output, the more the battle's severity increases the more it displays the performance. Also, commander specification Schwalbe Grazes are being operated, in many cases the passenger is fixed so customization is done to suit the pilot so there is a tendency for each machine's personality to stand out. Standard Graze use equipment retrofit is possible. -McGillis Fareed: adopted by the current head of the Fareed clan, Izunario Fareed(guy reflected on his sword in the OP?). Friend of Gaelio, Bauduin family is also part of the Seven Stars, and said to be engaged to his sister Arumiria which they haven't seen in a while. When he arrived to inspect the Mars branch it has been decided for him have a deep connection(fate) with Mikazuki and Tekkadan. -Wire Claw: shooting type claw for enemy MS restraint, used for clinging to enemy vessels. Captured item for Barbatos' equipping too. -McGillis Unit: It places emphasis on high output operation, adoption of Flight Unit equipment makes it possible to combat even within the atmosphere under the great influence of the planet's gravity. As a matter of course, the extra burden affects the pilot too and the machine's control becomes difficult, however, McGillis masters the technique. -Flight Unit: additional high output propulsion unit that used the same technology of interplanetary cruiser battleship's main thrusters. It becomes possible to fly above ground too. -Environmental activity: Similarly to the Graze which pursued versatility, the Schwalbe Graze's forte is to not select the environment to operate. In addition to making the equipment lighter, by means of the Flight Unit further high mobility is achieved; it's possible to cope with command, support and melee combat too since it's endowed with abundant armament variation. Next manuals are Graze Kai/Option Set 2 in 3 weeks, the week after are Hyakuri/Hyakuren and finally the 1/100 Barbatos in 10/29. Thanks for the translation as always. I'm curios on whether we'll ever see the unmodified EB-05, like maybe in an MSV or something. Aren't there any planned MSVs for IBO by the way? Would be strange if there wasn't a usual series dedicated for it. I dunno if they'd announce one so soon. I can't remember exactly when it was in the series' run (maybe about a third of the way?) that we first started hearing about things like the Catsith having a ground combat variation and maybe we'd see it in MSV, that sort of thing. Didn't the first Option Set not have any info ih the manual? Wonder if the Hyakuri manual will provide information on the missile launcher and bazooka parts that belong to it from the second Set or if we'll have to get that information elsewhere along with all the info on the first Set parts. Arsarcana wrote: I dunno if they'd announce one so soon. I can't remember exactly when it was in the series' run (maybe about a third of the way?) 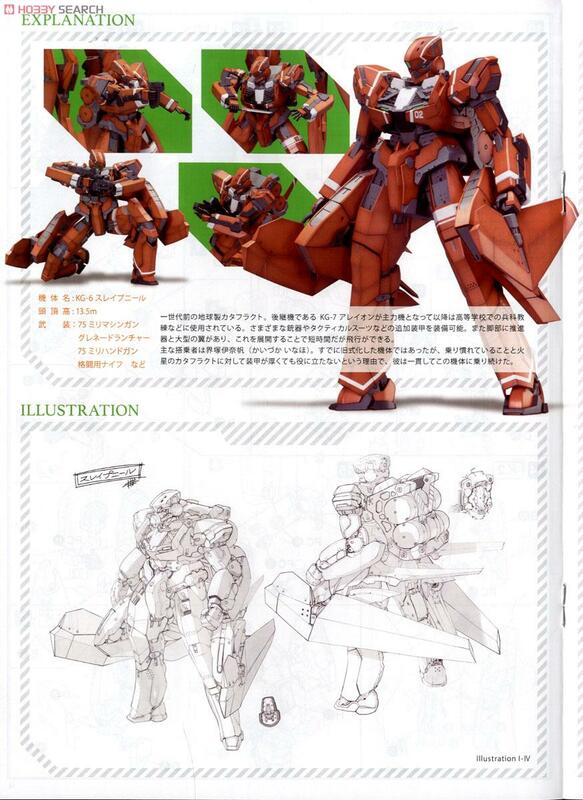 that we first started hearing about things like the Catsith having a ground combat variation and maybe we'd see it in MSV, that sort of thing. We're gonna have to wait until 11/20 to see the Barbatos Long Range Booster plus the other 2 January gunpla releases in Gunpla Expo. 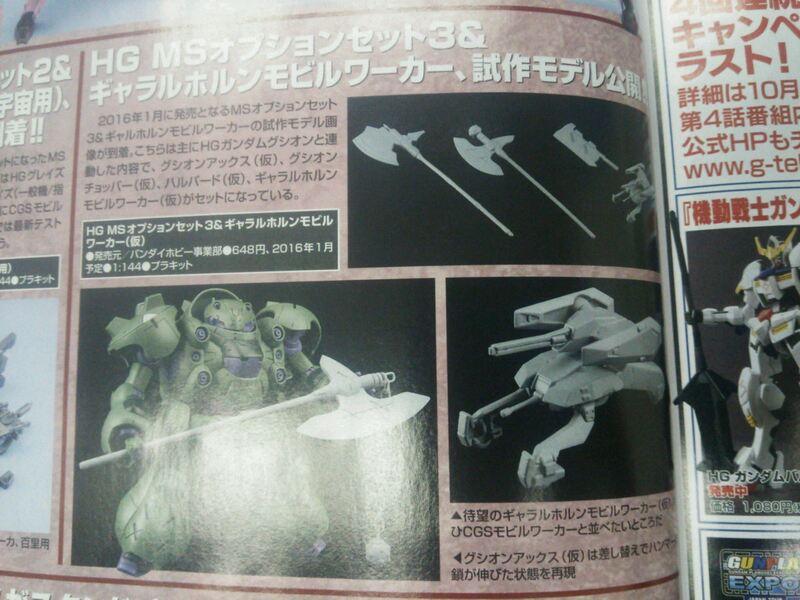 It may also spoiler the February gunpla releases. -If the Ahab Reactor stops the armor's strength goes down, however since it has a strong strong foundation not much is affected. Tearing the armor apart is different though. -Battleships are very sturdy because of their large Ahab Reactor so in a battle between them it's common to resort to hand to hand combat when boarding the enemy's. -Barbatos is already getting its Smooth-bore Gun in the next ep. Then the Graze Kai must be their own production too. They said the path to Earth they are taking is full of civilian enterprises so that must be what Brewers and Teiwaz are. Alaya Vijnana is going to be the key tech here; so far it has received more emphasis that the Ahab reactors. What is bottering me is why Mika had three times the surgery? To have tri-core spacial analysis prowness? As for the grazes, nice that at least for one series mass-production doesn't mean cannon fodder. So far the story has revelead that they are top-level machines, which makes for more interesting battles. Honestly like I mentioned in the anime thread I do believe that is the reason why he is able to pilot the Bardabos. I thought the KG-6 Sleipnir was designed by someone under the pseudonym "I-IV". nacho-wan wrote: Alaya Vijnana is going to be the key tech here; so far it has received more emphasis that the Ahab reactors. What is bottering me is why Mika had three times the surgery? To have tri-core spacial analysis prowness? Perhaps it's literally having the equivalent of three input/output channels; you can exchange & process 3x more data in the same period of time with your vehicle in comparison to someone with only one of the Alaya thingamabobs. This is in addition to the inherent advantage that a more direct man-machine interface already offers over the traditional manual control interface & audiovisual data feedback. I think the implants are called Whiskers if I'm not mistaken. Whiskers seem to be their nickname. Alaya Vijnana seem to be the formal name. In the latest episode, Galieo questions what is on Mikazuki's back and McGrillis calls that Alaya Vijnana system before explaining it. balofo wrote: They said the path to Earth they are taking is full of civilian enterprises so that must be what Brewers and Teiwaz are. If that does turn out to be true then they must be super loaded to be able to not only field their own mobile suits but also have their own designs. For some reason, I keep having this wild guess that one of them is some sort of secret separatist faction in Jupiter since Jupiter is likely to be involved in the future based on the HG. Maybe people who escaped from Mars after the Calamity War? Curious, has it been stated anywhere that the CGS Mobile Worker uses a "Hydrogen Engine" for its powerplant? An editor at Gundam Wikia just placed it for the article there without citing any sources and has not yet at this point replied to my query on the talk page over there. Fact checking and citations is one of the things I do a lot in Gundam Wikia so I wanted to ask anybody here in case they know anything about this being stated somewhere (to be fair to the editor, citing sources on the infobox is hard since it won't show up with our current coding). I've yet to see it in the forums I visit and I don't want to delete it if it turns out to be true so want to try and ask around before I either leave it or delete it. For what it's worth, the japanese wiki has the same claim and the source is listed as Gundam Ace, december issue i think. Alright thanks a lot! That's still something with a specific primary source citation. I will just leave it then.